You can rationalize it all you want, it's still a mean thing to do. This should be adjusted to give the minion Rush and not Charge. I've just been smashed by a priest who cast this on a 1/9 body and OTKed me with 120 damage to face (inner fire combo), and I had 40 Armor. Absolutely disgusting. 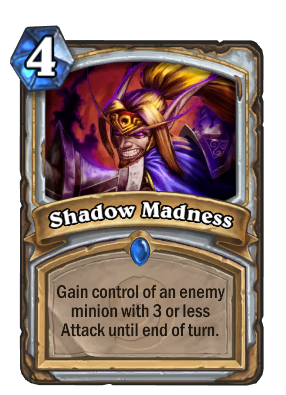 Well, Potion of Madness is probably better value, but if you want to steal 3-atk minions you still need Shadow Madness, so I wouldn't say it's totally dead. Taking control of an enemy Flamewaker will immediately trigger its 2 damage effect. Does anyone know if you can silence the minion after you steal it, and then keep it the same way Recombobulator works? Yes. It happened accidentally last year when i used to run a silence in a deck during Undertaker area, i wasnt really happy! Seems to have a similar effect with Dreadsteed, in that if you trigger the Dreadsteed's deathrattle, it stays under the Priest's control.